This is mostly completed and sounds great. 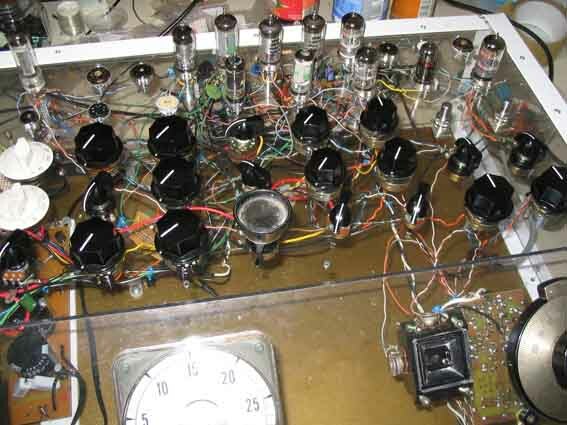 Being new to tubes I kept it simple and used CGS VCO , R.Schmitz neon VCO , E.Barbour's VCF(2), beam modulator, wave clipper and VCA. 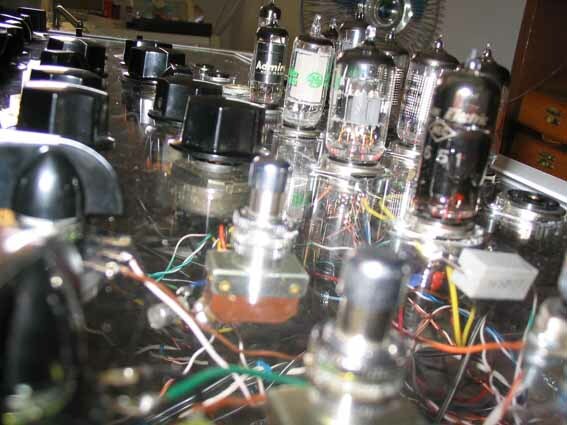 there are 3 LFOs using a neon tube each and 2 LFOs containing 3 neons apiece. These generate a more complex and fairly random waveform, vaguely reminds me of the CGS psycho LFO. 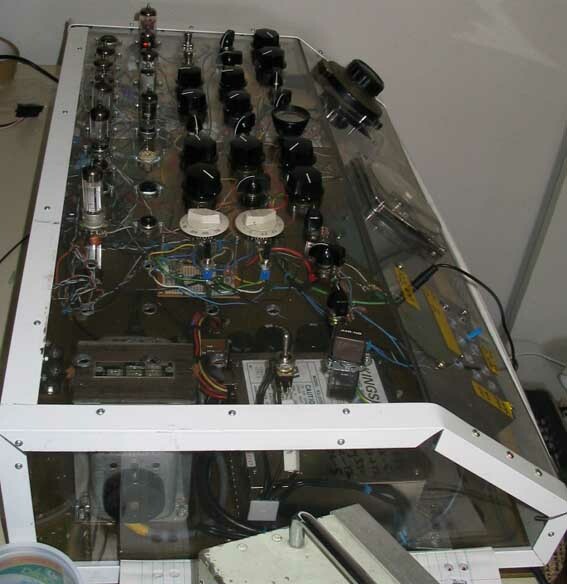 The complex LFOs are hooked up to the filters, the other 3 drive the beam modulator and VCA. 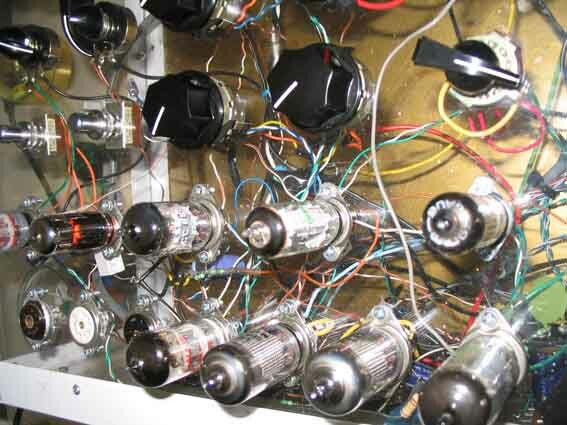 A select knob allows me to route the VCO outputs to the filters, clipper or BM. the neon LFOs can be switched off allowing external CV inputs to be used. The big voltmeter is off a train, ive had it for years, waiting to give it a home. its hooked up to the joystick which is wired as a pitch control. This synth isn't quite finished, ive left 8 tube sockets empty and enough panel space for a dozen pots....random noise source coming up! Still lots of tweaking to do, the inputs to the VCA affect each other so each will get its own triode to pass thru. The clipper (which sounds great) affects one of the complex LFOs, even tho they are not connected, nor do their wires cross....and a 100 other little jobs like panel labelling. 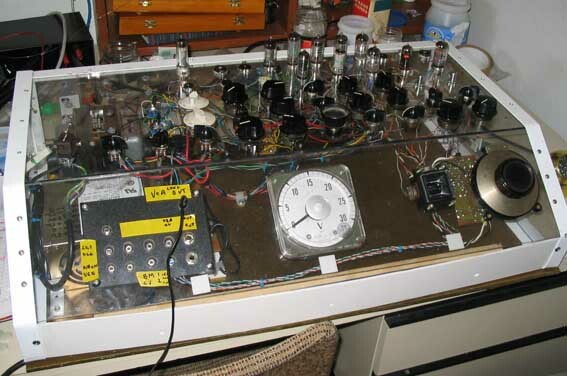 I used a lot of junk to build this synth, many parts came from dead TVs, the materials for the case and frame were found on the side of the road (once again - thanx bro!) For the power supplies, i used a 240>110V transformer and etched a simple PCB for some caps, diode ring, fuse, etc. it puts out 170V quite smoothly. When switched off the caps are shorted via a 3k 10W resistor, this way they drain in a minute, otherwise they will hold over 100V for at least an hour. I used a pooter's ATX PSU to warm the tube heaters, it was quite simple to tweak it upto 6.3 and 12.6V (hint - pin 1 on the chip).